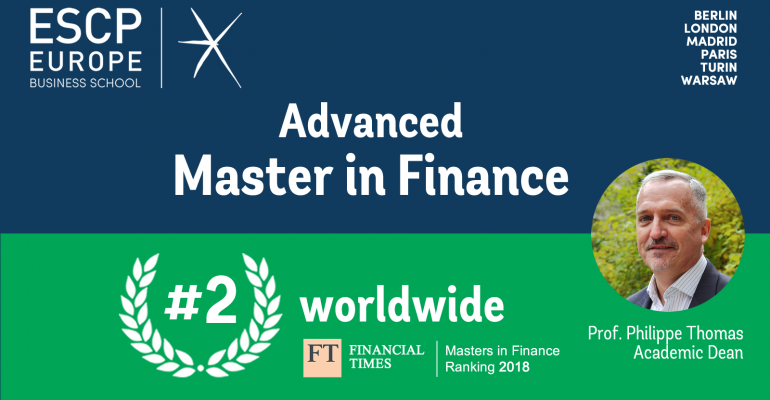 ESCP Europe’s Master in Finance (Master in Finance di ESCP Europe) has improved its global position, going up to the second place in the Financial Times ranking list, which analyses the best business schools in the world each year. According to the most important business ranking list, made by the British economic daily newspaper, the programme has the maximum punctuation for international job placement in the financial sector: it ranks first in career progression and international experience, besides the efficiency of its own career service. The increase by 48% of the average annual wage of participants – calculated before and after attending the Master – helped topping the list. Three years after graduation, participants are able to earn $111,341 on average, equivalent to 96,000 Euros. The programme, held in English and French in ESCP Europe’s London and Paris campuses, keeps its place for the fourth consecutive year as the best Master in Finance in the UK, famous excellence market of the financial sector, surpassing Imperial College Business School and Saïd Business School of Oxford University. For students who want to work in the bank market as well as in the investment market, the Master in Finance is planned to educate experts in investment banking, both in company finance and capital market. The Financial Times ranking list awards the international nature of the programme and the technical and professional qualities of professors, who work in close contact with finance leaders. This factor is significant to determine its trailblazing reputation. “The Master in Finance is in a constant dialogue with oustanding actors of the finance sector, allowing to change its content to fit the market needs – maintains Prof. Francesco Rattalino, Director of ESCP Europe Torino Campus -. This practical approach ensures the best quality for the courses, which is supported by the continuous top ranking in the Financial Times list”. At is 31st anniversary, the ESCP Europe’s Master in Finance keeps developing strong connections with international financial institutions, counting on a dinamic global alumni network. “The involvement of our alumni community is determining to add high value to the programme – adds the academic director of the Master in Finance, Prof. Philippe Thomas -. Our Alumni are, in fact, very active in the ’Advisory Board. They work in close contact with our teachers to ensure high-quality courses and accurate selection criteria for students”. “This Master is a programme for those who aim for academic and professional excellence – concludes Prof. Frank Bournois, ESCP Europe’s Dean –. The Master benefits form the important ranking of our business school, and the “2 countries, 2 languages” formula allows students to experience different technical aspects of the profession, as well as to benefit from features of two markets very different from each other, the French and the English market. In particular, or presence in London, the world’s financial centre, makes our programme very attractive to students from every part of the world”. 92% of participants has declared having reached the goal for which they decided to attend the Master. The Master in Finance is a full-time, one-year programme for students with a first- or second-level degree, with previous work experience. It is made up of three parts, where intensive courses in Paris (September-December) and London (January-April) alternate with an internship of minimum 4 months in a company. A thesis on an individual research project, consistent with the changing needs of the finance sector market, marks the end of the programme.